This is the easiest dinner recipe you will possibly make. My version of “Mississippi Pot Roast” requires a rub to impart flavor to the meat. The slow cooking method will create a delicious, tender roast your family will love. Apply rub, liberally to all sides of the CHUCK ROAST. I bought a 4 lb roast and cut it in half. Set roast in the bottom of your crockpot. On top of the roast, pour one McCormick AU JUS GRAVY packet and one HIDDEN VALLEY RANCH DIP packet. Sit one full STICK OF BUTTER on top of the roast. 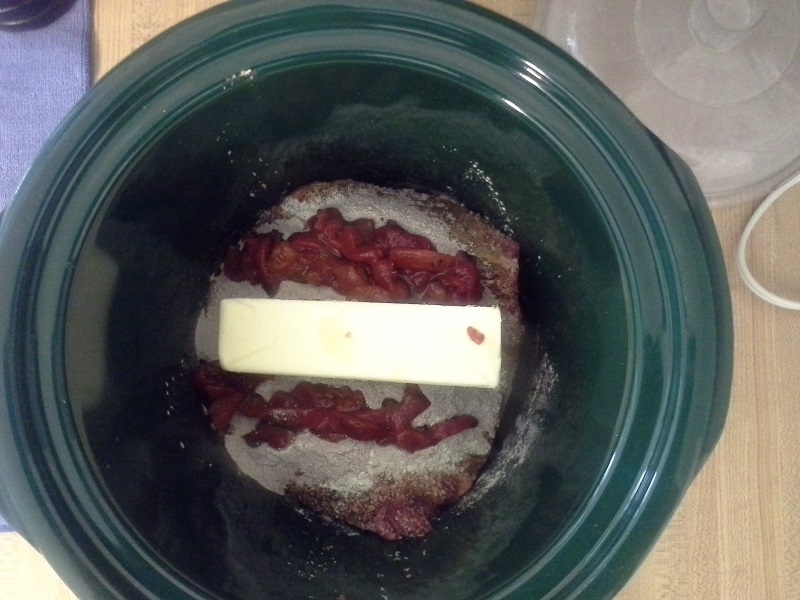 Lay approximately 8 jarred, roasted red bell peppers (drained) around the butter, on top of the roast. Place lid on crockpot and allow to cook on LOW for 8 hours. After 8 hours, gently remove roast parts (it should be falling apart tender). Spoon out 1 cup of liquid and combine with 1 tablespoon of cornstarch. Pour remainder of liquid into a saucepan. Whisk in cornstarch mixture to saucepan. Continue to whisk on medium heat till thickened. Let me know if you make this at home! This was a great dish. Meat was fork tender and flavorful. Hands down best roast I’ve ever had. The rub was amazing. Flavor was outstanding! Well done JoAnn.